World leaders have gathered in the Polish city of Katowice for the COP24 climate summit, where they will set out plans for implementing the Paris Climate Agreement. This weekend world leaders arrive in the Polish city of Katowice for the COP24 climate summit, where they will set out plans for implementing the Paris Climate Agreement. Over the course of two weeks governments are expected to make decisions which could move us closer to limiting global warming to 1.5 degrees Celsius above pre-industrial levels. Failure to achieve this would have serious consequences and crossing this threshold by even half a degree could trigger catastrophic and unprecedented climate-related impacts. So it is no surprise that, in the build up to COP24, environmental activists around the world have been ramping up protests in a bid to pressure their governments into taking drastic action. In the United Kingdom, protestors from the Extinction Rebellion Group have several times brought central London to a standstill by blocking roads and bridges. In Australia hundreds of students have taken part in school strikes, travelling from around the country to peacefully protest outside the Australian parliament in Sydney. But there will be few protests outside COP24 itself. Earlier this year the Polish government adopted a bill that prevents activists, NGOs and the general public from holding spontaneous assemblies outside the talks. Demonstrators must notify the city authorities in advance or risk prosecution. The bill also gives police extra powers to put conference participants under enhanced surveillance without their knowledge. 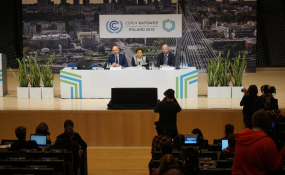 Essentially, the Polish authorities can treat COP24 as an opportunity to gather data on NGOs and strengthen their police powers. This comes in the context of an escalating crackdown on freedom of expression and peaceful assembly in Poland, characterized by a raft of legislation seen as curbing women's rights and undermining the independence of the judiciary. It is an incredibly dangerous moment to stand up against the destruction of the environment. But the bitter irony is that this is exactly the moment when the world needs to hear the voices of all those affected by climate change. We need to hear the perspectives of communities from around the world who are most affected by the effects of heat, drought and floods in their daily lives. Everybody, and especially those most affected, have a stake in what it is being discussed and should be able to express their voices including through peaceful demonstrations. The Polish government is denying these people a seat at the very table where their fate will be decided. It is worth noting that Poland has consistently resisted higher European Union targets on carbon emissions. Last week the Polish energy minister published a statement defending the country's reliance on coal, and argued that raising targets would harm the Polish economy. However, a poll commissioned last year by Greenpeace Poland showed that 74 per cent of Polish people support a shift from coal to renewable energies. The Polish government is out of step with its population. A recent UN report warned that we have just 12 years to avert catastrophic climate change. Poland, like all countries, has far bigger problems than the chants of peaceful protestors.